Property foreclosures remain a national epidemic. Tenants in foreclosed rental properties have federal rights under the 2009 Protecting Tenants at Foreclosure Act (PTFA), but too often these rights are violated, leaving millions of people vulnerable to housing instability and homelessness. After hearing from hundreds of tenants and advocates in our nationwide survey of PTFA violations, the Law Center jumped into action. We published a report, “Eviction (Without) Notice,” describing violations of the PTFA across the country, and provided recommendations for improving the implementation of renters’ rights. We also engaged strategic partners, such as the National Association of Realtors, to promote PTFA awareness and to facilitate voluntary compliance with the law. These efforts, combined with our ongoing work in Congress to strengthen the PTFA, have helped thousands of renters to avoid unfair evictions and stay housed. While the PTFA sets the minimum standard, the Law Center strongly supports other jurisdictions which can and should pass additional protections. The City of Chicago became a shining example in this regard on June 5th, when a 45-5 vote of the City Council overwhelmingly approved the “Keep Chicago Renting Ordinance.” The ordinance will require entities that take ownership of foreclosed rental buildings, such as banks, to act as landlords and offer tenants rent-controlled leases to stay in their homes or provide a relocation fee of $10,600 to each displaced family. The measure also requires lenders and buyers of foreclosed rental buildings to offer renters in the building leases with annual rent increases of no more than two percent, and to provide notice to the building’s tenants of the change in ownership, as well as information on the renters’ rights. Diane Limas, a community volunteer with Albany Park Neighborhood Council, explained the real impact that these foreclosures are having on families who are wrongfully evicted. “I can tell you in the past two years, more than 50,000 rental units (in Chicago) were impacted by foreclosure. Many of the units we encountered were occupied by families. When you’re displacing families, you’re pulling kids out of school in the middle of the year. You’re pulling people away from their jobs.” Millions of families that have kept up with their rent payments become at risk for homelessness when the PTFA is violated. With 37% of all children affected by foreclosure living in rental housing and the number of renters in the nation’s most populous cities increasing markedly, the effects of unlawful eviction can be hugely detrimental to American families. As stated in the Law Center’s recent report, rental properties constitute an estimated 20% of all foreclosures, and 40% of families facing eviction due to foreclosure are renters. Thus, the Chicago ordinance is a major step forward in securing the rights of renting families and providing them with proper housing security. 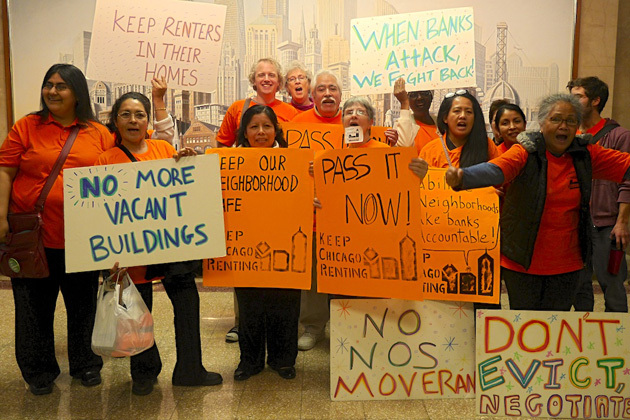 The Law Center strongly supports the Chicago ordinance and applauds activists like Limas who orchestrate massive grassroots support for the enactment of strong legal protections for renters.